The Summer Comfort Inside Pant Holster is lightweight and comfortable, featuring a snap-on design that allows the holster to attach and detach from your belt without taking your belt off. Its saddle leather construction retains its shape and is smooth and comfortable to wear. The Galco Summer Comfort features a full combat grip and will accommodate belts up to 1.75" wide. The Summer Comfort is a perfect concealed carry holster for all seasons. My glock 26 fits perfectly in it. Galco is always quality. I will order more from Copsplus. I have one for my G19 Gen4, G20, and G26 Gen 4. All of them are of top notch quality. I love it. Very comfortable. Also, CopsPlus was wonderful and quick during the entire process. 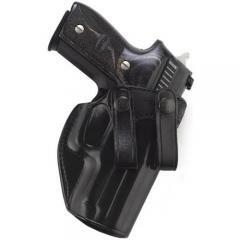 Great quality holster, but if your a heavy set individual or not used to wearing IWB. It will be uncomfortable at the 4-5 position and ok at the 3 o'clock. Would recommend it unless your heavy set like myself. Galco had been a standard of high quality for me from 1980 on, as I worked a 33 year career as a special agent for USDOJ, INS. The new holsters live up to my expectations. Cut is correct and the design is effective for retention without need of a strap. Stitching is tight and straight and provides firm shaping. The throat design ensures sufficient strength to enable reliable one handed holstering. The dual belt snapstrap design enables positioning athwart a belt loop to anchor the gun at a specific point on the waist. The coloring and final coat are strong and tend to grip the cloth of shirt, pants or skivvies. A very good product delivered for well under a hundred bucks Well done, Cops Plus. Great quality, comfy holster. Even with my larger sig 229 I can wear it all day without even realizing it's there. Is the holster only carried in the one angle position, or is it adjustable? The angle is not adjustable. Yes, this will fit a 1911 full size. Does this holster have replaceable belt snaps? Holster does not come with any replacement belt snaps.